I'm enjoying the Aussie romance fiction being published by Penguin Group right now. The genre is growing Down Under and Penguin's Destiny Romance series is doing a great job of capturing new and exciting authors. 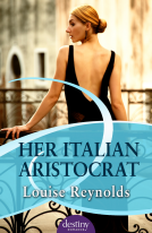 Louise Renalds' release, Her Italian Aristocrat, was no exception. The book was fast paced and fun and steered well clear of the traditional romance cliches that make you want to gag. Simple, easy reading for the busy modern woman. After separating from her no-good husband, Erica Jewell is in deep debt and in desperate need of a new do. She's sworn off men altogether, until she finds one in her front yard bleeding to death from a bullet wound. Enter Jack Jones: the leader of a vigilante group who recruits Erica to play her part in helping prevent a terrorist attack. Kathryn Ledson's debut novel is full of fun, romance, danger and action, and the type of lead character one could base a series on. Her writing style took a few pages to get used to but I warmed to her tone quickly and soon found myself reading into the wee hours of the morning. It was refreshingly different to hear the Aussie voice portrayed realistically and to have the lead characters tread familiar turf in Melbourne and Sydney. An exciting read, full of exciting twists and turns and the type of ending that makes you want a little more. Perhaps book two? With a failed marriage now in the rear-view mirror, Annajane Hudgens is ready to move on and leave behind the small town where she grew up, found love and established her career. Both she and her ex-husband, Mason, are engaged to other people and she has a great new job ahead of her in Atlanta. She's so ready to move on that she's even able to attend her ex-husband's wedding - no awkwardness there at all... complete closure. Until one little hiccup on Mason's big day sparks a chain of events that puts the spotlight back on the town, the people and the very man that broke Annajane's heart. Will she get a second chance with the man she has never really stopped loving or is her future with someone else? The arrival of spring may have coloured the town with flowers coming to bloom but Annajane is about to learn there are also dark secrets that lurk beneath the surface. This book was a pleasure to read and I particularly liked the characters Mary Kay Andrews had created. The conversations between the characters were realistic and entertaining and there was little by way of soppy, love-soaked, over-the-top dialogue. This is a great, lazy Sunday read. There's nothing like reading a fun, light-hearted romance on a lazy Sunday afternoon. I often find it hard to come across a unique storyline in this genre but author, Jill Mansell, did a great job of keeping things interesting. When Nadia meets a handsome stranger, Jay, during a snowstorm, they wind up in a run-down hotel for the night waiting for the bad weather to pass. There are more than a few sparks flying between the two of them but Nadia makes a point of telling Jay about her comfortable relationship with a cover-model boyfriend. Fast-forward a little while and Nadia finds herself, once again, bumping into this handsome man, only this time a few things have changed in her life and Jay's certainly taking notice. Put your feet up, make a coffee and enjoy this easy, sweet read.